Land is still, and probably always will be, an attractive investment. It’s a tangible, long-term asset, and it’s not subject to the sometimes chaotic fluctuations the stock market experiences, or even the significant ups and downs the real estate market in some parts of the nation goes through. Land continues to be a solid, long-term investment. If you’ve been considering buying a tract of land, you’re probably a pragmatic individual! 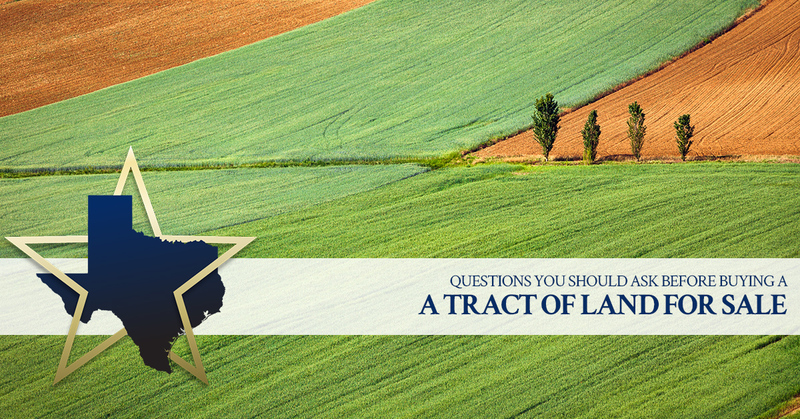 If you’ve never purchased land in Texas (or anywhere, for that matter) before, we’d like you to consider the important questions you need to ask before you dive into your land search. Am I Ready To Hold On To This Land A Long Time? If you’re an impatient investor who wants to see quick returns on your investments, and you’re used to riding a quickly rising market in order sell as fast as possible, this investment may not be for you. On the other hand, if you want a tangible investment that increases in value perhaps more slowly but also more steadily, without being subject to sharp, unpredictable fluctuations other investment vehicles may experience, then investing in land will likely appeal to you and meet your investing criteria. Buying Texas ranch land is not only a dream come true for many people, it’s a great investment if you’re prepared to hold on to your piece of land for years, not just months. Over time, land typically increases in value. The longer you can hold on to it, the higher in value it will likely go. What’s more, as demand for your land increases, so will its asking price. For example, say you purchased rural Texas land that was located far away from any city developments. You hold on to it for a few years, and the value of your land increases steadily but modestly. During that time, nearby cities have expanded outwards, inching closer to your rural land. In a few more years, developments have reached your area, and developers are suddenly eyeing your property as a valuable addition to their development plans. Suddenly, your land value increases enormously. As cities both large and small continue to grow and expand out, this scenario becomes more commonplace, which means that you need to carefully consider where you want to search for lots for sale in Texas in addition to being prepared to hold on to your land for many years. Do I Want To Develop, Or Leave My New Rural Property Undeveloped? Once you’ve decided you want to purchase land and you’re ready to hold on to it for the long-term, the next question you’ll want to consider is what to do with your property while you have it. Will you develop on it, or leave it undeveloped? You have options to choose from. For example, you can build a small vacation home or cabin on your property, as long as you follow all the associated regulations of developing on your piece of property. What Can I Use My Land For? You can use your new Texas ranch land for your own herd of cows or sheep. You and your family can farm a portion of your land, growing your own organic produce and perhaps even selling it to local restaurants and at regional farmers markets. Or you can use your land for recreational purposes. Decide whether you want to make use of your purchased land, or whether you simply want to let it remain unused while you hold on to it as part of your financial investment portfolio. Either option is fine, and it’s totally up to you which one you prefer. We just want to point out that great use options do exist. Where Will I Get The Financing I Need? Once you’ve gotten a better feel for what you’ll do with your land, whether it’s developing it, letting your cows graze on it, growing vegetables for your family, or simply holding on to it without doing anything to the land, it’s time to think about how you’ll pay for your land purchase. You may discover that it’s not that easy to get a loan from a bank, even one you’ve done business with for many years, for the East Texas land you hope to buy. Is it time to give up? Of course not! There’s always a way; it’s just a matter of finding it. Many people have found that owner financing is the way to go. What Are The Benefits Of Buying Owner-financed Land? Other than the down payment, you don’t have to pay with cash, which means more properties are available to you even if you’re not cash-rich and you can’t secure a traditional loan. When you don’t have to get a bank loan, you don’t have to pay the associated closing costs. Seller-financed land typically has fewer related fees. Many times, an owner-financed land purchase transaction closes more quickly than a bank-financed one. Often, there’s more room for negotiation when dealing with seller financing. If you’re ready to look at beautiful lots for sale in Texas and you’d like to make the most of owner-financed property options, turn to the land-selling specialists at the Creekside Ranch Group. We’re here to help turn your Texas ranch land-owning dreams into reality! Reach out to learn how we can assist with your land purchase.